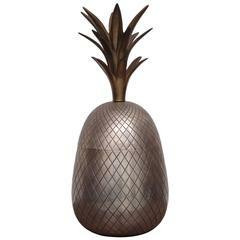 Extraordinary huge brass pineapple ice bucket, trinket or candy box. Never seen a brass pineapple box in this size. 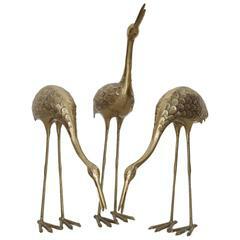 Extraordinary huge set of three flamingos or cranes made of brass. They are in very good condition and they bring the Hollywood Regency glamour in every room. 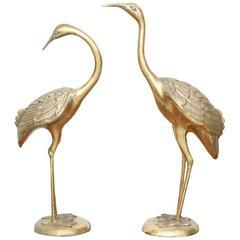 Beautiful pair of flamingos or cranes made of brass. They are in very good condition and they bring the Hollywood Regency glamour in every room. Big brass pear as an ice bucket. Very nice patine. Perfect detail on the top near the stalk. Mid-Century Modern large (41 cm) Danish sculptural hand moulded teak platter or bowl. Beautiful Scandinavian table or desk piece in excellent condition. Two decorative trays in brass, chrome and mirror Italian 1970s by Willy Rizzo. Measures: Big tray: D 23cm. or 9in. Smaller: D 13cm. or 5.12in.